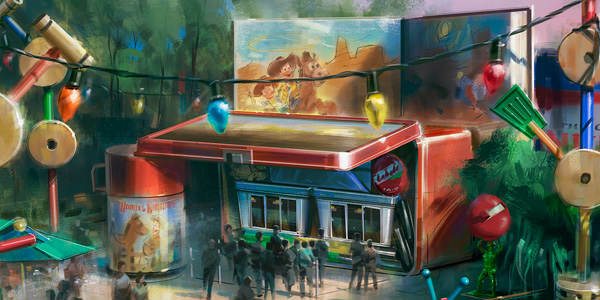 Disney has released the first details of a new area in their upcoming Toy Story Land at Disney’s Hollywood Studios called Woody’s Lunch Box. This eatery is fashioned from Andy’s lunch box and thermos, and will feature a walk-up quick-service window that will serve up tasty meals and old-fashioned soda floats. It appears in the rendering provided by Disney that a seating area with umbrellas will be nearby for guests to use while eating. Mini Baybel will be the quick-service restaurant’s partner, so I’m guessing the little cheese snacks will be included in some meal combos (perhaps the kid’s meals). 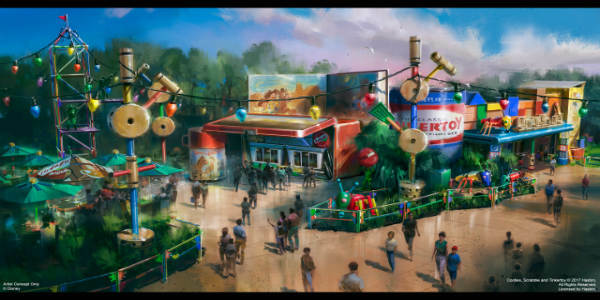 Woody’s Lunch Box and the rest of Toy Story Land is scheduled to open Summer 2018.